I arrived early at the unique Saddledome arena to witness the clash of sticks between the Flames of Calgary and their near neighbours the Edmonton Oilers. You do not have to understand ice hockey to appreciate the atmosphere. Over 20.000 seated spectators in climate controlled air conditioning, animated cheerleaders, loud rock music and of course the body checking heroes the players themselves. The excitement of an ice hockey game was just one of the highlights when I visited Calgary, home to the world famous Stampede and the venue for the 1988 Winter Olympics forever associated with Eddie the Eagle by British sports fans. If you visit just one museum in Calgary then ensure it`s the Glenbow Museum. The Glenbow is an art and history museum situated across the road from the Calgary Tower but its ethnology collection containing approximately 48,000 items associated with the indigenous peoples of North America particularly the people of the Northern Plains is stunning. The Museum also tells the story of Southern Alberta and the West so is a must view for those visiting the city and the province of Alberta. The Calgary Tower is not one of the world`s highest observation towers (191 metres – 627 feet) but it does provide a wonderful panorama of the city and of the Canadian Rockies out to the West. For those brave enough a glass floor extension was constructed on the north side of the tower’s observation deck so that when standing on the glass you can look straight down onto the streets below. A day at the Calgary Zoo is a relaxing break from the city and to look at many of the native wildlife I saw when I travelled westwards to the Rocky Mountains. The Zoo can be reached by Calgary’s C-Train light rail system, by car via Memorial Drive, and by bicycle and footpath via the Bow River pathway. A large portion of the zoo is located on St. George’s Island in the Bow River. At Drumheller, a location internationally recognized for its rich abundance of dinosaur fossils I visited the Royal Tyrell Museum of Palaeontology and stopped off at Horseshoe Canyon, Swinging Bridge and the Hoodoes which are tall rock pillars created from wind and water erosion of soft sandstone topped with a much more resistant rock. Over time the weather creates the tall red rock pillars which look like petrified mushrooms. One of the most interesting places I visited was the oddly named, Head Smashed in Buffalo Jump which is one of the best preserved buffalo jumps in the world. The Jump recognises a method of hunting practiced by native people of the North American plains for nearly 6,000 years. The Blackfoot people were able to hunt bison by stampeding them over a cliff after which they carved up the carcasses. The view from the cliff was magnificent, it was possible to see the United States over forty miles away. 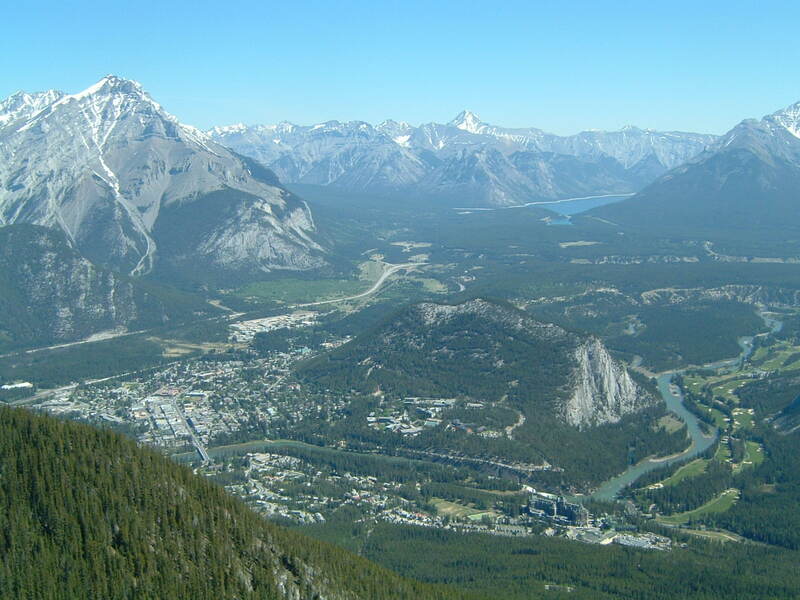 Having spent several days in or around Calgary I then travelled to Banff situated within the Canadian Rockies. The Rockies are stunning and the best way of observing them is to take the ten minute cable car to the top of Sulphur Mountain. The views from the top were breath taking. Outdoor bathing may seem an odd choice at -5C but in the Hot Springs Pool the temperature of the water is 40C. A visit to Lake Louise and it`s famous lakeside Chateau is also a must do whatever time of the year you decide to visit. I walked around the lake and hired a canoe to row parts of the lake. Remember it`s a glacial lake so is very cold and very deep so can also be very dangerous if care is not taken. The Icefields Parkway also known as Highway 93 North is one of the most beautiful long mountain drives in the world passing stunning alpine scenery along its full length. If driving ensure you fill up with fuel before you leave because there is only one fuel station on the full 230 km (140 mile) long road at Saskatchewan Crossing but expect to pay double the usual price for the fuel. 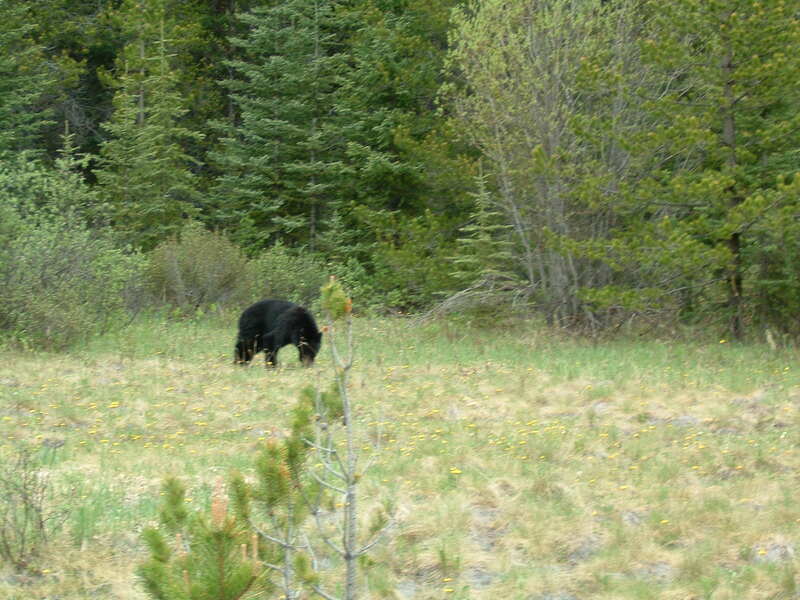 I remember driving out of the services back on to the highway and seeing a grizzly bear foraging at the entrance paying little or no attention to my vehicle. I saw a number of Grizzly and Black bears as I was travelling along the highway as well as mule deer, golden eagles, marmots, elk, coyotes, jays, bluebirds, mountain sheep with huge horns and Robins the size of Blackbirds. When I got out of my car and went for a short hike down to the Athabasca Falls I was always aware that I was a visitor walking around in their `back yard`. The highway also passes close to the Athabasca glacier so I bought a ticket at the small interpretative centre which enabled me to take a coach on to the glacier itself. I got on a the coach which took me to the lip of the glacier from where I changed on to a specially adapted sno-coach which took me up and over the steep snow and ice past hidden crevasses and fresh snow falls high onto the glacier itself. The guide told me that the ice under my feet was as thick as the Eiffel Tower is tall. The views were amazing and knowing that the glacier was moving as I stood on it added a new dimension to the experience. Awesome, as many of my Canadian friends would say! I soon discovered that if you see a coach or several cars parked up along side the highway it usually means that some of the wildlife has been spotted. I came across a group of vehicles and slowed down to see what everyone had stopped for. The passengers from the coach were taking photographs and looking up into the tops of the trees where i could see a black bear breaking off small branches and letting them fall to the ground. What was to follow was hilarious as the bear began to descend the tree rather rapidly. A frantic rush back to the small entrance to the coach followed as people pushed and shoved each other to get back on the coach as the bear came down the tree. The elderly spectators need not have worried too much as the bear calmly sat at the foot of the tree chewing on the young leaves it had thrown down to the ground. At the end of the Parkway drive there is the small town of Jasper, The Jasper Skytram, which takes visitors to The Whistlers’ summit is well worth a visit. You can also visit the Fairmont Jasper Park Lodge and play a round of golf or take a boat out on the lake – see how the `other half spend their holidays! From Jasper I travelled eastwards to the provincial capital of Edmonton staying at the superb Fantasyland Hotel in the West Edmonton Mall. The Mall is an amazing place with a water park, amusement park, golf course, ice rink, restaurants, submarine and a lake with a full size replica of the Santa Maria and over 800 retail units. Awesome! Before leaving Edmonton on my return to Calgary and the flight home I spent an afternoon at the TELUS Space and Science Centre where I watched an IMAX film and and took a trip through its interesting Planetarium dome. Alberta has lots more to offer, vibrant cities and stunning natural landscapes. I am already looking to my return visit to Western Canada in the very near future.